Stevens (1984, p 40) gives the following definition that expert systems are machines that reason and think as an expert would in a specific domain. For instance a medical diagnoses expert system may request as input the symptoms of patients, other similar facts and test results using these as pointers it may search its database for information that may lead to the recognition of illness. A true expert system not only performs the traditional computer functions of managing huge number of data but it also manipulates that data so the result is a meaningful answer to a less than wholly specified query. 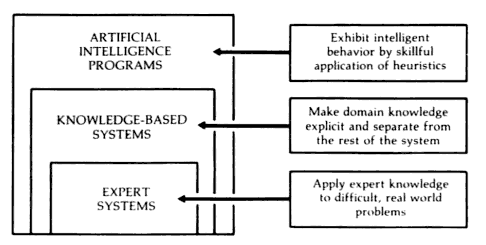 An expert system can be also defined as a computer system that simulates human experts in a given area of specialization (Stevens (1984, p 40) cited in Castillo, Gutierrez and Hadi (1997, p 2). 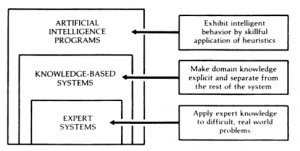 Patridge D and Hussain K M (1992), Artificial intelligence and business management, Ablex Publishing, USA, p 149-150. Castillo E, Gutierrez J M and Hadi A S (1997), Expert systems and probabilistic network models, Springer, New York, p 2.